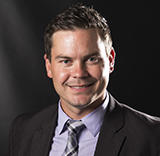 Michel is a partner at Weaver Simmons, the largest full-service law firm in northeastern Ontario. He is bilingual and specializes in labour and employment law. He is known as a fearless advocate for his clients. He is married to Elyse and has one son, Carter. A: This is home. The lakes, the fishing, the nature, the views. There is also a very significant francophone presence in Sudbury and this is something I’m proud to be a part of. Living in Sudbury has also provided the opportunity to achieve a healthy work-life balance, which, in the legal profession, can be challenging. A: Being a father and my family. I am also extremely proud and grateful about being made partner at Weaver, Simmons LLP. A: Never let anyone tell you that you’re not capable of doing something. If anything, use it as a source of motivation. A: I have a couple. Don’t be afraid of what can go wrong and be positive about what could go right. Be productive and efficient at work so you get home early enough to spend some quality time with your family. A: Never hesitate to take a risk be it personally or professionally. You can’t get to the place you most want to be without taking that risk.